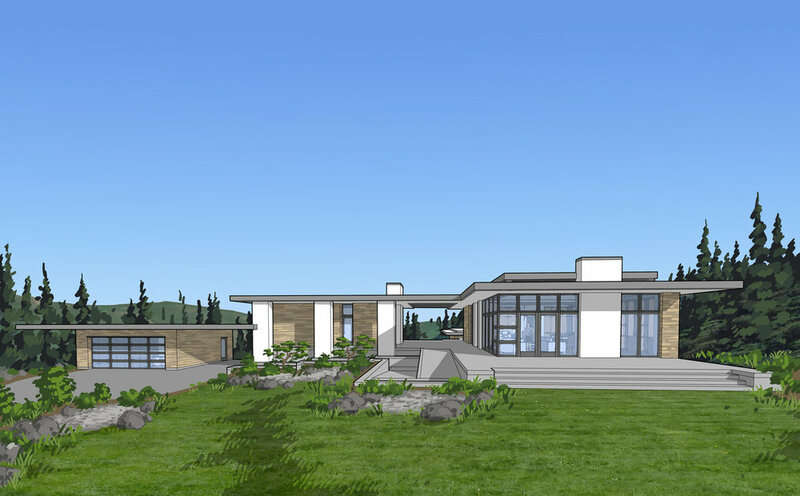 We were asked to design a new modern house with a guest house for a client currently living in Silicon Valley. The new home and guest house will be built on a 20-acre lot in Marin County off Lucas Valley Road. Initially, the 3,500 square foot house will be a weekend retreat but eventually will become their full-time residence. The 640 square foot guest house will be accessible in a wheelchair for a disabled relative. The main living areas of the house are to be also be wheelchair accessible. The house is oriented to capture the two best views of the lot: a view of the hillsides beyond and a view overlooking a meadow. The house design and orientation on the site also optimizes access to natural light throughout the house. The lot is a very wooded area with moderately sloping land. The buildable area of the lot was predetermined by the county and is in the center of the lot. The house is accessed by a 1000 foot private driveway. We have recently submitted and passed the design review entitlement process and we are currently developing the permit/construction drawings for the project. D. V. Rasmussen & Son, Inc.